My pharmacy training taught me many things that’s for sure. The importance of vitamins and minerals was certainly emphasized and their lack was strongly linked to many disease states. The need to ensure adequate calcium levels for good bone health was particularly highlighted. The dairy industry does a tremendously good job in educating the public to believe that dairy is the only way we can obtain calcium. 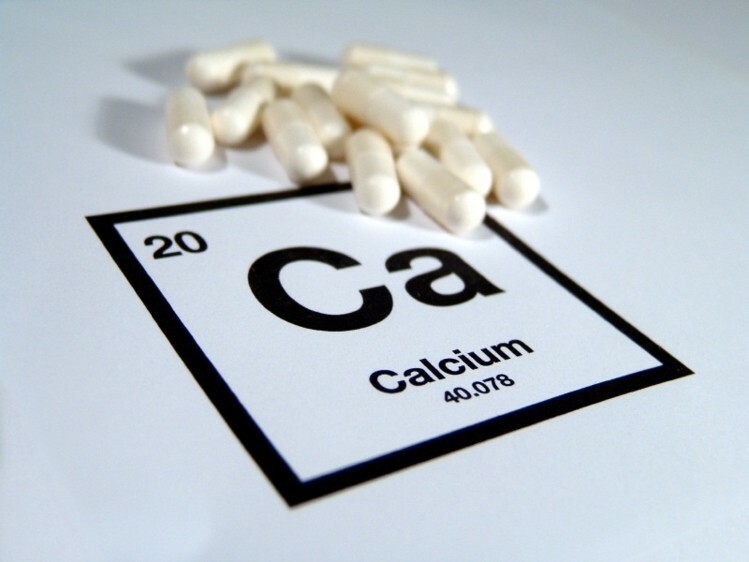 The pharmaceutical industry does an even better job in suggesting that supplementing with traditional calcium tablets is both beneficial and necessary if dairy intake is low or if bone density tests show signs of osteoporosis. I’m here to tell you that both these points are lies. Now that you have fallen off your chair or gasped in horror, let me explain myself further. Bones do need calcium, that’s true. But bones are not just calcium. SO WHAT ARE BONES MADE OF EXACTLY? Calcium and phosphorus are the most abundant minerals in your bones, together forming insoluble calcium phosphate crystals (mainly as hydroxyapatite). About 65% of adult bone mass is hydroxyapatite. Other minerals stored in your bones include magnesium, sodium, bicarbonate fluoride. potassium, manganese, silica, iron, zinc, selenium, boron, fluoride, sulphur, and chromium. Along with minerals, bone is composed of an organic matrix composed primarily of the collagen (a protein) which provides flexibility. 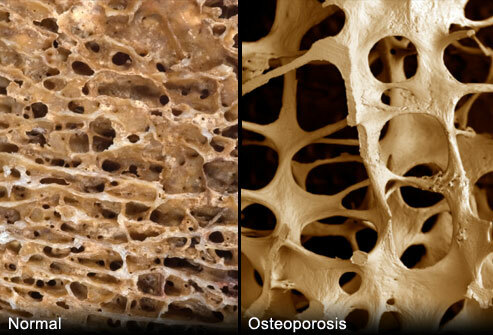 Adult bone mass is 10% collagen. Surprisingly, water comprises approximately 25% of adult bone mass also. So, bones are actually made up of minerals, collagen and water. It’s true that dairy is rich in calcium, but as I have just explained, bones are more than just calcium alone. However, dairy is highly inflammatory to the body as a side effect. Inflammation weakens our gut, which in turn weakens our overall immunity (since 70% of immune system lives in the gut). 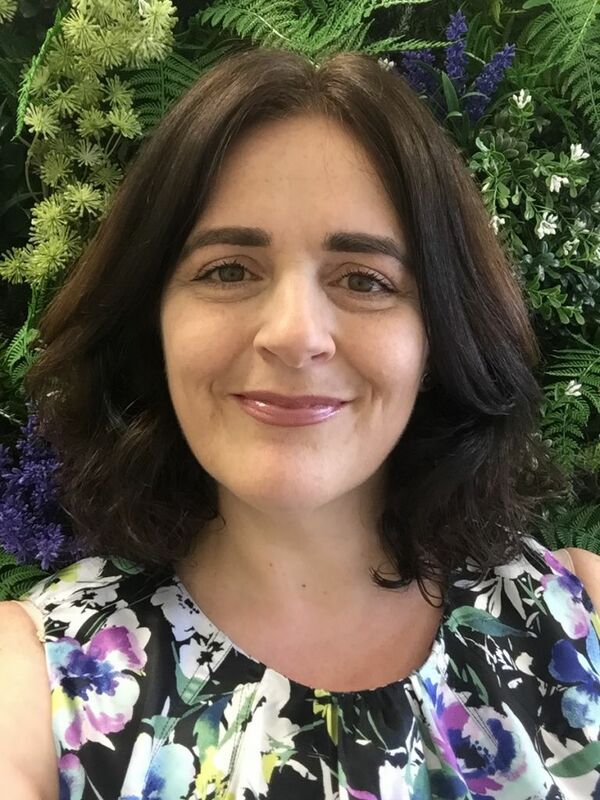 Many autoimmune disorders are a result of inflammation and ironically this also includes osteoporosis and osteoarthritis (recognised autoimmune conditions). So dairy products can actually create bone disorders long-term rather than prevent them, since chronic inflammation can lead to weakened bones. 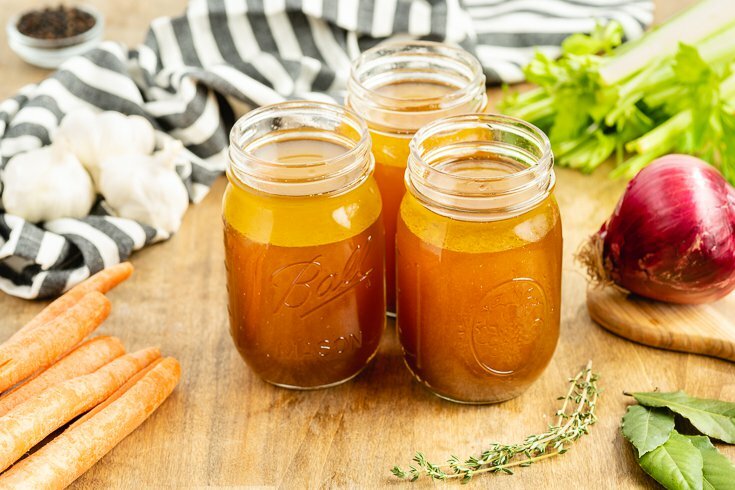 There is no better way to ensure we get enough collagen into our body than enjoying a good bone broth. Bone broth is full of gelatin and collagen, both super healing to our gut, skin, joints, and especially bones. I also recommend collagen powder as the perfect addition to one’s diet. It’s unflavoured and can be added to any food or drink with ease. Traditional calcium supplements available to consumers generally only contain singles ingredients such as calcium carbonate, calcium citrate, calcium gluconate, calcium lactate and microcrystalline hydroxyapatite concentrate. You may not like where they are sourced however, They are usually from marble, eggshells, snail shells, seashells, along with animal bones. Worse yet, their absorption rate can be a dismally low 1-9%, which means most of the product remains in excess supply in the body and doses not reach the bone. On a side note, consumers are often told to take their calcium supplements in the morning along with vitamin D, although calcium should be taken at night for best absorption rates. Regardless of what form you take, calcium supplements should always be balanced with magnesium. Generally, the rule is one parts magnesium to two parts calcium. While calcium is clearly important, there are at least 19 other key nutrients that each play a vital role in the structural integrity and overall health of our bones. The major players are vitamin D, vitamin K and magnesium. Vitamin D levels need to be checked, and if low, supplementation given until a level of 150nmol/L is obtained (best level to manage chronic disease states). The body’s innate ability to absorb calcium will vary significantly from one person to the next, based mainly on their stomach acid level. Low stomach acid (often a result of stress) leads to poor calcium absorption and encourages a state of calcium excess within the body. In our society today, this would have to be the most important factor in disease progression. Low stomach acid (hypochlorhydria) prevents the absorption of many vitamins (such as vitamin B12), minerals (such as calcium, magnesium, zinc and iron), and protein (providing vital amino acids). Symptoms of low stomach acid include gas, bloating, burping after meals, acid reflux or heartburn, difficulty swallowing pills, nausea after taking supplements, prolonged fullness after eating, and undigested food in stools. Ensuring adequate stomach acid is easily achieved by using the correct salt in our diet – mainly Himalayan pink salt or Celtic sea salt. We are constantly reminded by the medical profession that we must keep our salt intake low to prevent cardiovascular disease. This only applies to traditional white table salt and is truly not an issue when you use the right salt instead. Sadly, as a result of following this outdated rule, we have become an increasingly mineral-deficient population. 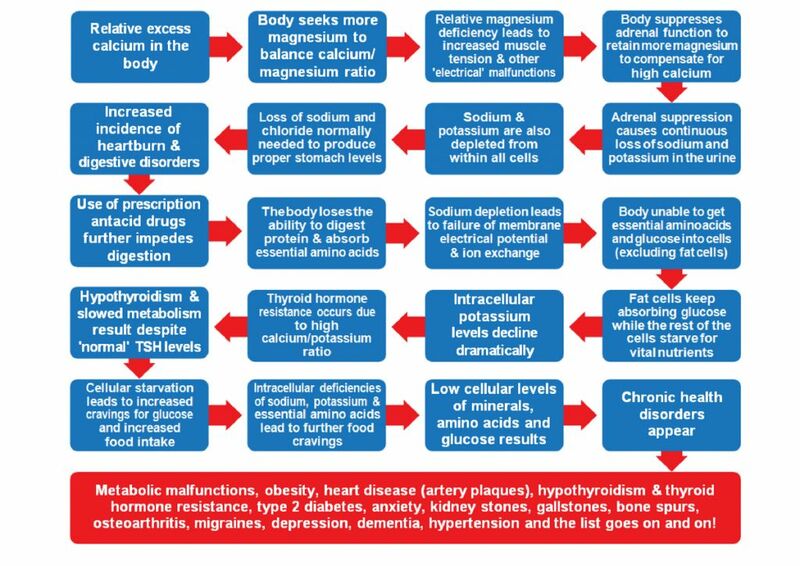 The trouble with supplementing with only calcium products is that it leads to relative deficiencies in the other minerals needed for healthy bones, further worsening the calcium imbalance, leading to a dangerous ‘calcium cascade’ of events and ultimately, chronic disease (shown below). If you want strong bones, you need strong stomach acid. 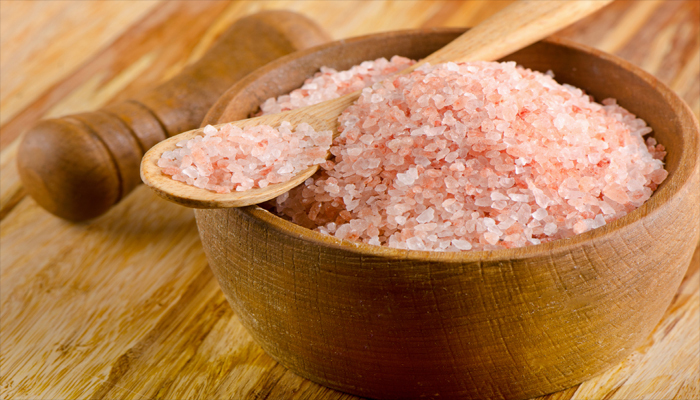 To achieve that you need to INCREASE YOUR GOOD SALT INTAKE, which is primarily pink Himalayan salt or Celtic sea salt. Both of these salts contain over 80 minerals, which are well recognised by the body and readily absorbed. Ensure you get adequate calcium from your diet. if you need extra, make sure YOU BALANCE YOUR CALCIUM INTAKE IF SUPPLEMENTING WITH MAGNESIUM ALSO. 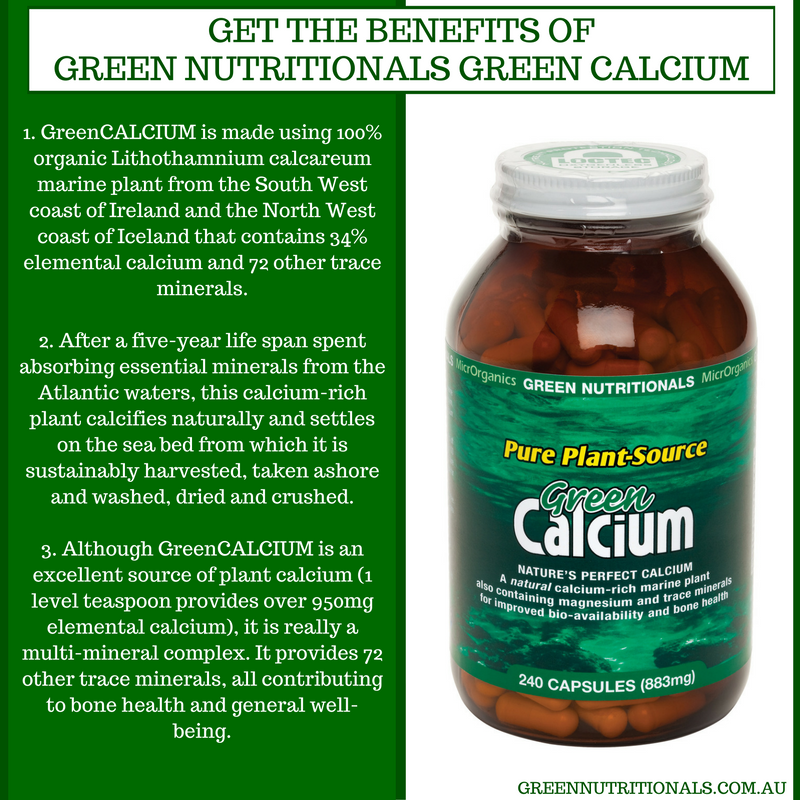 My preferred calcium supplement is a marine plant-based calcium (such as GREEN CALCIUM by Green Nutritionals) which is really a multi-mineral complex. It provides 72 other trace minerals, all contributing to bone health and general well-being. It has a unique porous ‘honeycomb-like’ structure and the large surface area that allows for greater absorption and utilisation of calcium in the body. Make sure you include some NETTLE LEAF TEA and either BONE BROTH OR COLLAGEN POWDER into your regular routine. Lastly, DRINK PLENTY OF FILTERED WATER for well-nourished bones, since bones are 25% water after all.